Private Lessons at our Dog Training facility or at your home. Private lessons provide one-on-one training sessions with The 21st Century Dogman - Mike Beckett. Each session lasts approximately 1 hour. Mike will deal with general issues or a specific issue you are having with your dog. He will help you understand the cause of the problem and how to open the lines of communication with your dog to solve it. Example: Chaos at the Front Door. Does your dog make a mad dash for the door every time it's opened? Does your dog greet visitors with a nip or a bite? Does your dog bark uncontrollably and/or jump on your visitors? 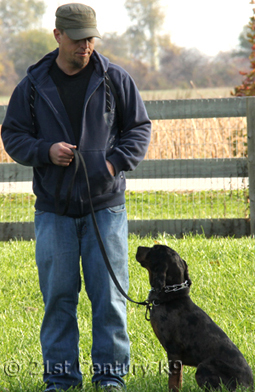 Mike will teach you how take command of your dog and regain control of your front door. Dogs of the Future for the Future. 21st Century K9 is a Responsible and Reputable Breeder of the Dutch Shepherd Dog, the German Shepherds Dog and Belgian Malinois.